Stunning Keisha: Vote Today For Cathy Keisha! 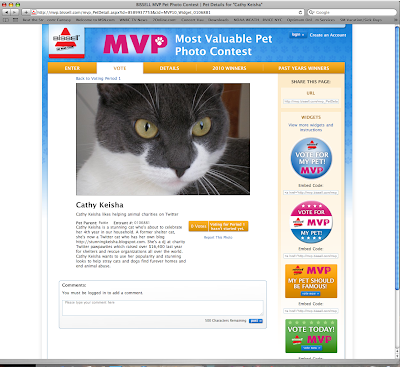 As you can see, I've entered the Bissell MVP Most Valuable Pet Contest. I hope to do better than last year when I got all of 21 votes now that I have the backing of all my Twitter and FB furrends. I don't need to win the picture of myself on a Bissell product. I'm so stunning that will just help make more dough for a multi-million-dollar corporation. I'm looking to win the $10,000 donation to the pet charity of my choice. That would be so cool! It would also be nice to win a new vacuum for Ma even though the Electrolux Harmony we have is extra quiet and should be required in all houses where there are pets. Even I'm not too scared of it. Now what are my favorite animal charities? Bet you thought "that CK is selfish and only thinks of herself." Wrong. Ma has always been a card-carrying member of PeTA but they get enough $$ from Chrissie Hynde and other celebs. In no particular order, here are some of my charities. Popcorn Park Zoo in Forked River, NJ. They rescue animals from circuses, zoos, animal shows, etc. who are abused or about to be destroyed; or as they describe it "a sanctuary for abandoned, injured, ill, exploited, abused or elderly wildlife, exotic and farm animals and birds." Ma and Pop have visited and have gotten to feed the animals. They are a part of the Associated Humane Societies and get moneys from them, still it's nice to sponsor a pet. Companion Animal Placement, which is the organization that rescued me from the Liberty Shelter, a kill shelter. They don't really have a web site or any fancy bells and whistles. They work out of my V-E-T and have a shelter in Hillsborough, NJ where I was housed. I'm sure they could use $10,000. 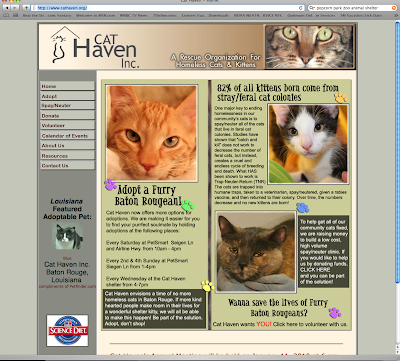 Cat Haven, a rescue organization for homeless cats and kittens in the Baton Rouge, LA, area. Why Baton Rouge? Ma's friend moved down there a long time ago and works with them. She's a vetinary assistant. She helped save Ann Gora after her fur came off. We know any organization she works for has to be good. Brookes Legacy Animal Rescue in Naples, Florida. My Aunt Karen volunteers with them. As their site says, they are all about second chances and all their pets were about to be euthanized the day they saved them. It was named after a human, Brooke Ashley Miller, who died way too young. If I should win, I'd be open to other suggestions. But these are my main charities. Starting January 8, please vote for me. Vote early and often. Thank you and God bless. You rock, CK! I'm so proud to be friends with a kitty that has such a kind and generous heart :-).